Summer is the time for luscious, sun ripened tomatoes. If you grow them at home it is easy to save your own seed for sowing the following season. Tomatoes are generally self-pollinating so you don't have to worry too much about keeping your variety pure. This is because the flowers pollinate themselves before they open fully. There is a small chance of cross-pollination by insects sneaking into the flowers early, so if you grow more than one variety it is best to separate them with a tall crop or put them, say, 10 metres apart. There are just a few simple steps to saving and storing tomato seeds for next season. Choose the best early fruit from the strongest plants to save your seed from. Make sure the fruit is ripe before you pick it. As tomatoes continue to ripen after picked leave them in a bowl until they are a bit more mature than you like to eat them. 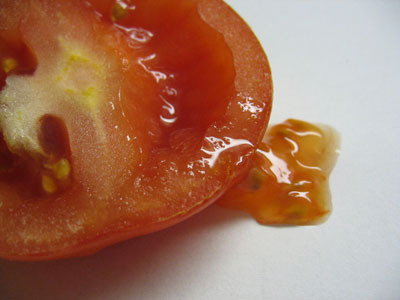 Scrape the seed along with the surrounding pulp from your chosen tomatoes into a jar or bowl. Leave it at room temperature for a few days until it starts to ferment. You will see the pulp start to break down. This step is important as it mimics the natural process and removes the chemicals in the pulp that stop the seed from germinating. It also makes the pulp easier to wash off. Put the seed and pulp in a sieve and wash the pulp off. Spread the seed out to dry. Some people place the seed on kitchen paper to dry and then just roll up the paper to store the seed. This is fine for small quantities but tedious if you are saving lots. Spread them on a tea towel or newspaper and move them around occasionally so they don't stick together. When dry place in a paper bag or envelope for a few weeks so final drying can take place, before storing away in an air-tight container for next season. This method of fermenting the pulp before removal also works with other seeds that are in a pulpy mass, such as cucumbers. The Bega Valley Seed Savers is keen to expand the varieties of tomato seed they make available and would be delighted to hear from anyone willing to share seed.